GINGRICH, Newton Leroy, a Representative from Georgia; born in Harrisburg, Dauphin County, Pa., June 17, 1943; attended school at various military installations; graduated from Baker High School, Columbus, Ga., 1961; B.A., Emory University, Atlanta, Ga., 1965; M.A., Tulane University, New Orleans, La., 1968; Ph.D., Tulane University, New Orleans, La., 1971; teacher, West Georgia College, Carrollton, Ga., 1970-1978; elected as a Republican to the Ninety-sixth and to the nine succeeding Congresses (January 3, 1979-January 3, 1999); reprimanded by the U.S. House of Representatives on January 21, 1997, for allowing a Member-affiliated tax-exempt organization to be used for political purposes and for providing inaccurate information to the Ethics Committee; minority whip (One Hundred First through One Hundred Third Congresses); Speaker of the House (One Hundred Fourth and One Hundred Fifth Congresses); reelected to the One Hundred Sixth Congress but did not take his seat; unsuccessful candidate for the Republican nomination for President of the United States in 2012. Papers: 1970-2005, 1,415.73 linear feet (4,796 boxes). The papers of Newt Gingrich contain materials from his congressional career, including articles, bills, calendars, campaign files, correspondence, news releases, photographs, videos, and other sources of information. There are also materials related to his pre-congressional campaigns and post-Speakership years. Some material is restricted. Finding aids are available online. Papers: In the Associated Press Records, 1938-1992, 3.5 cubic feet. Other authors include Newt Gingrich. Papers: In the Alvin Toffler Papers, 1955-1985, approximately 117,000 items. Subjects covered include Newt Gingrich. Oral History: In the Virginia Shapard Lee Papers, 1988, 3 audiotapes. Subjects covered include Newt Gingrich. Oral History: In the United States Capitol Historical Society Collection, 1975-1991, 13 items. The collection includes an interview with Newt Gingrich. Papers: In the W. Edwards Deming Papers, ca. 1795-1994, 70 linear feet. Correspondents include Newt Gingrich. A register is available in the repository and online. Papers: In the Vin Weber Congressional Files, ca. 1950-1995, approximately 14.5 cubic feet. Other authors include Newt Gingrich. Oral History: In the Southern Oral History Program Collection, 1973-2000, 2827 interviews. Includes an interview with Newt Gingrich. Videocassettes: 1980-1992, 5 videocassettes. Includes twelve commercials used during the campaigns of Newt Gingrich for the 1980, 1982, 1986, 1990, and 1992 U.S. congressional elections in Georgia, Republican Party. Anderson, Alfred. Challenging Newt Gingrich. Eugene, Ore.: Tom Paine Institute, 1996. Drew, Elizabeth. Showdown: The Struggle Between the Gingrich Congress and the Clinton White House. New York: Simon & Schuster, 1997. Gillon, Steven M. The Pact: Bill Clinton, Newt Gingrich, and the Rivalry that Defined a Generation. New York: Oxford University Press, 2008. Gingrich, Newton Leroy. "Belgian Education Policy in the Congo." Ph. D. diss., Tulane University, 1971. ___. 1945. New York: Simon Schuster, 1995. ___. Lessons Learned the Hard Way, A Personal Report. New York: HarperCollins, 1998. ___. NewtWit! New York: Doubleday, 1995. ___. 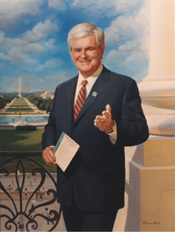 Quotations from Speaker Newt: The Little Red, White, and Blue Book of the Republican Revolution. New York: Workman Publishers, 1995. ___. To Renew America. New York: HarperCollins, 1995. ___. "Spendaholics: The Real Cause of Our Big Deficits." In A House of Ill Repute, edited by Dan Renberg, 4-16. Princeton, N.J.: Princeton University Press, 1987. ___. Winning The Future: A 21st Century Contract with America. Washington, D.C.: Regnery Publishing, Inc., 2005. ___. Rediscovering God in America: Reflections on the Role of Faith in Our Nation's History. New York: Thomas Nelson, 2006. ___. Real Change: From the World That Fails to the World That Works. Washington, D. C.: Regnery Publishing, Inc., 2008. ___. Understanding Trump. New York: Center Street, 2017. Gingrich, Newt, and Richard Armey. Contract with America. New York: Times Books, 1994. Gingrich, Newt, David Drake, and Marianne Gingrich. Window of Opportunity: A Blueprint for the Future. New York: St. Martin's Press, 1984. Gingrich, Newt, and Jackie Gingrich Cushman. 5 Principles for a Successful Life. New York: Crown Forum, 2009. Gingrich, Newt, and William R. Fortschen. Pearl Harbor: A Novel of December 8. New York: Thomas Dunne Books, 2007. Gingrich, Newt, William Forstchen, and Albert S. Hanser, contributing editor. Gettysburg: A Novel of the Civil War. New York: St. Martin's Press, 2003. ___. Grant Comes East: A Novel of the Civil War. New York: Thomas Dunne Books/St. Martin's Press, 2004. ___. Never Call Retreat: Lee and Grant: The Final Victory. New York: Thomas Dunne Books, 2005. ___. Never Call Retreat: Lee and Grant: The Final Victory. (Gingrich and Fortschen's Civil War Trilogy). New York: St. Martin's Press, 2007. ___. To Try Men's Souls: A Novel of George Washington and the Fight for American Freedom. New York: Thomas Dunne Books, 2009. Gingrich, Newt, and Richard Lesher. Meltdown on Main Street: Why Small Business is Leading the Revolution Against Big Government. New York: EP Dutton, 1996. Gingrich, Newt, Dana Pavey, and Anne Woodbury. Saving Lives & Saving Money: Transforming Health and Healthcare. Washington, D.C.: The Alexis de Tocqueville Institution, 2003. Gingrich, Newt, and Nancy Desmond. The Art of Transformation. N. p.: CHT Press, 2006. Gingrich, Newt, and Terry L. Maple. A Contract With the Earth. Foreword by E. O. Wilson. Baltimore: Johns Hopkins University Press, 2007. Gingrich, Newt, and Vince Haley. Drill Here, Drill Now, Pay Less: A Handbook for Slashing Gas Prices and Solving Our Energy Crisis. Washington, D. C.: Regnery Publishing, 2008. Gingrich, Newt, with Joe DeSantis. To Save America: Stopping Obama's Secular-Socialist Machine. Washington, D. C.: Regnery Publishing, 2010. Maraniss, David, and Michael Weisskopf. Tell Newt to Shut Up! : Prizewinning Washington Post Journalist Reveal How Reality Gagged the Gingrich Revolution. New York: Simon & Schuster, 1996. Rodkey, Geoff. NEWTisms: The Wit and Wisdom of Newt Gingrich. New York: Pocket Books, 1995. Shirley, Craig. Citizen Newt: The Making of a Reagan Conservative. New York: Thomas Nelson, 2017. Steely, Mel. The Gentleman from Georgia: The Biography of Newt Gingrich. Macon, Ga.: Mercer University Press, 2000. Warner, Judith. Newt Gingrich: Speaker to America. New York: Signet, 1995.